Hannah peeked out of the guestroom. Rhythmic snores droned from the master bedroom, like they were in stereo sync. They wouldn’t wake for hours. Maybe even noon. But today, she wouldn’t be here at noon. Adrenaline surged through her thin frame. Her legs trembled. This had to work. This was not time for one of her miscalculations or poor judgment calls. She’d been accused of that a lot lately. Whether it was true or not. She clutched two suitcases, then took one last look around her room. So much she was leaving behind. Clothing, shoes, cheap jewelry. Most of it chosen for her anyway. She had packed what mattered; she was sure of it. One last glance at the closet. There was that garment bag. A knowing settled over her, as warm as the midday sun. She would never wear what was inside that bag. It was not coming with her. Memories flooded as she ducked into the shadowed hallway. She held her breath. Too long, she’d endured the bitter here. Wave upon wave, it had pounded her shores, overwhelming the sweet. Now, with each creak of the floorboards beneath her feet, her spirits lifted. As she neared the front door, she couldn’t bring herself to look into the living room. The shiny, black grand piano she’d dusted every single day before she’d played for the past three years would stay behind. She’d find a way to buy one of her own someday; she was sure of that. Even if she had to find twenty extra music students to pay for it. Outside, the gravel crunched beneath her feet. At the car door, the key shook in her hand. It clattered against every part of the metal except the hole. She used her other hand to steady it, till it finally went in. Gently, she put the suitcases into the backseat, the same two she’d used since she was a teenager. All she’d keep of her life’s belongings fit inside a pair of cubes. But she had what she needed, including the journal. The only treasure she had of his, tucked inside the pocket of one of the suitcases. All of it, in her daddy’s handwriting. She’d read it so many times that she had most of his entries—his prayers—memorized. A thud resounded. Hannah whipped around toward the cottage. Had someone heard her? She didn’t spot anyone, and the front door remained closed. It was time to test her 1947 blue Studebaker Champion to see if she still had enough champ left in her to make the trip. The Champ was hardly new when Hannah bought her. Winters and salt laden roads had eaten away parts of the frame since, yet she had a hum to her—some may call it a rattle—that soothed Hannah like the lullaby her mama used to sing. It was familiar and always there. But not a sound she wanted lighting up the neighborhood when trying to escape unnoticed. The Champ was her first big possession, paid for with what little money she’d managed to tuck away from those music lessons she’d given. Those kiddos were the only people she’d miss from this city. The way Eli cheered when he finally got the C sharp minor chord right on the guitar. Or the way Joy beamed when her right hand could play a different rhythm than her left on the piano. Now, that was a special talent. Not everyone had it. Hannah knew well how to blaze across the keys in different rhythms; it came so naturally to her. But the same did not characterize her life; it always seemed out of sync, especially with her desires. An ache knotted Hannah’s throat. She couldn’t say goodbye to those kids. She’d had to keep far too many secrets these days. Telling them about this—planning for this exact moment—she couldn’t do it. Headlights turned the street corner, startling her. She ducked down behind the car in the driveway, hoping whichever neighbor was coming home at this hour didn’t see her. The vehicle passed with a whir. She waited a couple more seconds, released her breath, then slid onto the driver’s seat. She steeled herself against tossing up a prayer as she pulled the door closed. No, it wasn’t needed; this was up to her alone. She could do this. And she wasn’t sure anyone would listen anyway. She had prayed enough for intervention in the past. That her mother wouldn’t die, for starters. But it would be fine. All she had to do now was push on that gas and fix her eyes on her destination. Her neck throbbed. As she glanced in the rearview, the purple bruises were still visible. Why didn’t she grab her collared sweater? Well, maybe because she hated that dark pink and white garment. It made her look like a wrapped up piece of ribbon candy. And this would be the last time someone would leave a mark. Hannah turned the key in the ignition. The Champ sparked to life. Just like that engine, she had the power within her to run, the power to not be a victim any longer. How had she forgotten that for the past three years? It was all a blur. But with the Champ’s racket, it was time to get out of here. She pressed on the gas, knowing she’d never see that little yellow cottage again. An unfamiliar feeling, the corners of her mouth turned up. Her stomach fluttered; she’d waited her entire life. Now, it was time to return to the place her father used to call home until twenty-seven years ago. Until his death, a smattering of hours before her birth. HANNAH STRETCHED OUT HER FINGERS. They hurt, throbbed from her grip on the steering wheel. She had to calm down. Gripping herself tightly wasn’t necessary anymore, right? How many miles had she driven by herself before this trip? Ten, maybe fifteen at a time. Her odometer had logged over one thousand since yesterday morning. She’d stopped only for fuel or a quick bite, and to sleep in Quebec. The silver-haired motel attendant there didn’t appear to notice that she’d lied about her name. Not when he handed over keys to her room, or when she dropped them back off this morning before she left. “Have a safe one out there,” he’d said, as he slid the keys back onto the nail below Room 21. Safe. Something she hadn’t known in a long time, but fully intended to find. The sun glared off her back windshield. Within a few hours, it would settle in for the night. WELCOME TO SPRINGHILL. Population 7,802. The brown wooden sign tilted slightly to the left. Yet it looked as sturdy as the hills she’d passed on her way into this idyllic town. And she did feel welcome. Even as a stranger. Maybe a small town was just what she needed. A place with roots, with personal history. Would she like living where most people knew one another by name? And probably their quirks, habits, let alone their secrets? It wasn’t a place to remain anonymous. But maybe people here had your back. 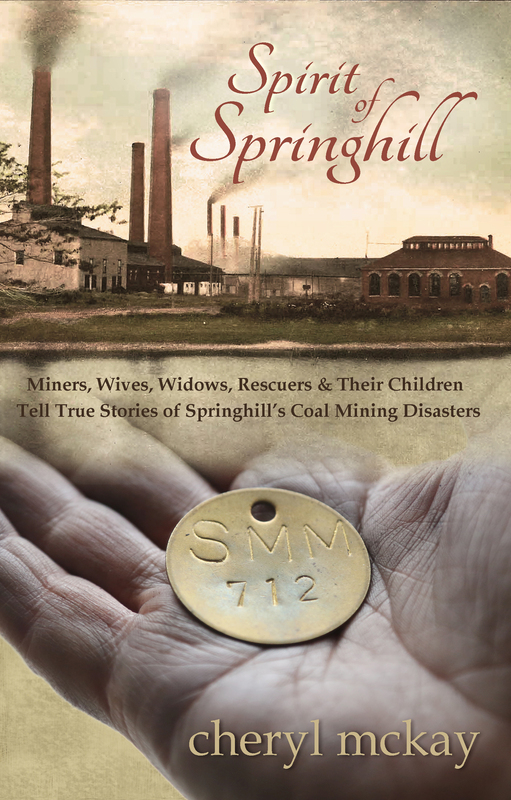 Maybe Springhillers—as her mama used to call them—would care if something felt or seemed off. Maybe they actually looked each other in the eyes instead of turning the other way. How could she feel like a stranger and at-home, all at once? She snaked the Champ through a few side streets off Junction Road. Slowing to a crawl, she surveyed a few homes—all different styles and colors. And small. Very small. Cozy was a nicer way to look at it, especially since they seemed so inviting. So different from where she grew up. If only her mother had moved them back here. Or even stayed here from day one. Maybe life would have been different. Her mother would still be alive. As she surveyed the neighborhoods, she felt like a new homeowner, taking a stroll through a brand new house, eyeing fixtures, moldings, and windowpanes. Not that she really knew what that felt like. Having a place of her own lived only in her imagination. Her dreams. The Champ turned up Main Street, a hilly road that was home to businesses on both sides: gift shops, bakeries, a grocery store, a church. A newspaper office, a furniture store, a café, a hardware store, a pharmacy, a diner. Well, they sure had what they needed here. Just about every store was personalized with a name, whether a surname or first. No doubt, the people of this town ran Springhill’s Main Street. A rounded clock tower on the post office showed it was almost two-thirty. “What on earth?” A chuckle escaped her lips. What kinds of lies were they telling each other? Was one pretending to be a hero? Was the other spinning tall tales of his royal British roots? With a bench like that in town, she might fit right in. Though she preferred to think of her lies as protection. When the two old guys looked over at her, one signaled his salute. She returned the gesture, then continued the Champ’s crawl up Main Street by All Saints Church. There was a place she knew from Mama. A little girl played hopscotch out front. Oh, to be as safe as that little girl seemed. It was time to focus. She had to find her. In a town this size, someone must know if Aunt Abigail still lived here. Or “Abby” as her mother used to call her. 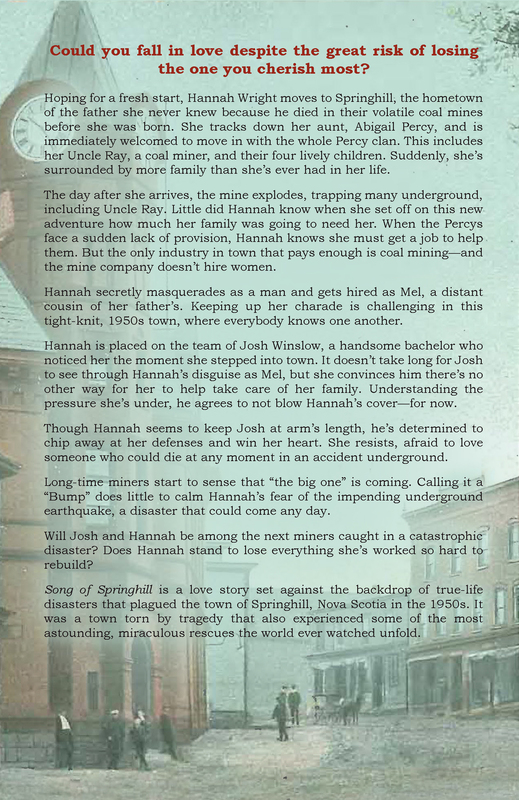 Hannah’s heart would rest better when she tracked her down. What if she wasn’t alive anymore? What if she didn’t want her here? There wasn’t any reason she wouldn’t, was there? Regardless, Hannah would never retrace her steps to where she’d been. No matter what happened here, going back to Toronto was not an option. Did her aunt look anything like Daddy? Maybe she’d see for herself. Today, perhaps. Her stomach fluttered again. At the top of Main Street, on her right, rested a building that had plenty of lights. The sign out front blinked: Hector’s Pool Hall. The P in pool was dimmer, barely hanging on like the last of a candle’s wick. Hopefully, someone in there could help her. The eleven ball ripped into the corner pocket with a clunk. Josh Winslow blew on the end of his cue stick. Blue talc puffed into the air. Josh had no intention of losing this round to his comrade, Moosey. No, he couldn’t, or Moosey would be an insufferable braggart all night underground, like a vulture circling its fallen prey. When Josh first coined the name Moosey, it had nothing to do with the giant taxidermied head mounted over Moosey’s fireplace. A hunted down trophy of Moosey’s grandfather. No. The moniker had everything to do with Moosey’s rotund frame getting caught between the coalface and a stone pack. This was during Moosey’s first night on Josh’s team, 4500 feet below the earth’s surface. Moosey may not have appreciated the comedy with a side of pain at the time, but Josh and his buddies sure did. They still laughed about it. Thankfully, Moosey had a healthy sense of humor to go with his appetite. When Hector opened this pool hall, it was his way of finding a new path in life, outside “the deeps,” those dark, musty shafts carved deep into the earth’s surface. Hector was a one-man show. Couldn’t afford any employees. Josh liked to give him business whenever he could. Well, that, and he liked to beat Moosey at Eight Ball or Snooker. Josh wondered how—on a miner’s salary—Rosalie could keep Moosey fed. “Don’t you two gotta get to the mines?” Hector asked. Josh looked at the clock: two-thirty. Hector was right. When the rake operators brought miners up from the prior shift, there’d better be a new crop to head down and keep that production going. Three o’clock, on the dot. Mine productivity controlled this town’s survival. More than once Josh had to wait underground while the rake operators sent up coal cars with the black stuff, instead of letting their aching bodies warm the rail cars. Moving coal took priority. But was the company paying them for their time waiting? Not a chance. Well, at least he had a job and could put food on his table. Even if it was a table for one. Josh sunk his last striped ball. He aimed for that black eight when the front door chimed someone’s arrival. A female. An attractive one at that. Seeing an unfamiliar woman around here was momentous. Even Springhill Record newsworthy. “So and so’s Great Uncle Marv visited this weekend.” Yes, they did report that stuff. 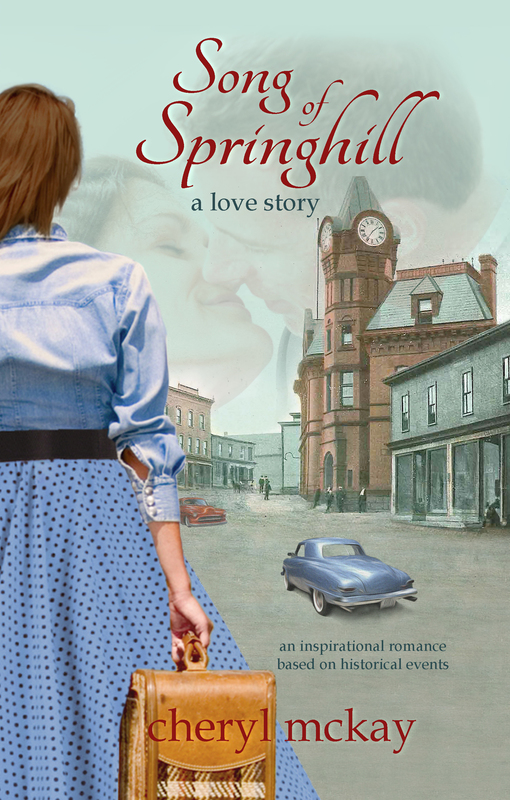 Sometimes, Springhill was a slow news town. Slow news days were good because it meant there were no problems in the mines. Maybe this chestnut-haired beauty was unattached. A man could hope, right? Too many months, years even, had passed since he’d been willing to request a date. Much to the chagrin of Mary Lou Lipnicki, who relentlessly dropped the most obvious hints. “Ow!” Where did that table come from? “Wonderful!” Relief swam in her deep brown eyes. Her olive skin was so clear, so untouched by the harsh sun. “Who would be askin’?” Josh ignored Moosey’s snort. Josh swallowed. He hadn’t heard that name in a long time. “Well, color me overjoyed.” Hector reached over the counter to gather her into an enthused embrace. Josh noticed her upper torso tense. Hector kept on hugging. At least she was polite about it. “Nice to meet you, Hector.” Hannah smiled. It may have been small, perhaps even reserved, but it lit up her whole face. Was he coming on too strong? Josh didn’t care. It never hurt to let a seemingly kind and attractive young woman know he was available. He took her hand in a gentle shake. If she were Melvin’s daughter, she was in her late twenties, five years younger than he was. As he lingered, she removed her hand from his. This woman wasn’t going to make it easy. He searched for a sparkle in her eyes but sensed something else. Fear, maybe? One who protects herself with walls. Thankfully, breaking down barriers didn’t scare him. After all, he was a miner adept with a pick. He considered this woman a welcome challenge. Winnie. Not exactly a strong name to impress a lady. But silly names underground signaled acceptance as part of a team. She’d learn that soon enough if she were going to stick around. His insides warmed at the thought. As Hannah drove down the road, she wondered why that man looked at her the way he did. Josh was his name. She was a stranger to him, right? At his age, had he not found a suitable wife? He was pleasing to the eyes, certainly, with his chiseled nose and strong jaw line. But he was glancing the wrong direction. She may be here to seek connection, but that was not the kind she was looking for. As Hannah spotted the street sign for Maple, there he was. Oreo, the Dalmatian, right on the corner. Josh was right. The dog’s abdomen rose and fell rhythmically with each pant. If only life were that simple for humans. This was a predictable place in many ways. And for Hannah, predictable—like the classics she’d played on the ivory keys for the past decade—was just what she needed. To read the full book, see the links below. Below are the links where you can find it in US and Canada. (Other countries, check your Amazon sites.) I’ve also put a synopsis below if you’d like to know more about the story before you buy. For paperback orders, you can order through Createspace, a division of Amazon.com that will send the book to Canada. You will need to create an account with them separate from your Amazon.ca account.